If your site has been hacked, Don’t Panic. This article will describe how to clean your site if it has been hacked and infected with malicious code, backdoors, spam, malware or other nastiness. This article was updated on Friday March 20th, 2015 with additional tools you can use to clean your site. This article is written by Mark Maunder, the founder of Wordfence. I’m also an accredited security researcher, WordPress developer and I own and operate many of my own WordPress powered websites including this one. Even if you aren’t running WordPress, this article includes several tools that you can use to help clean your site from an infection. 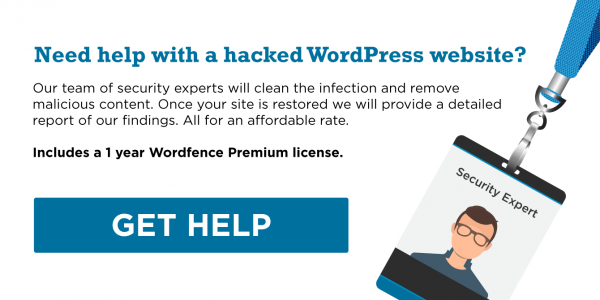 If you are running WordPress and you have been hacked, you can use Wordfence to clean much of the malicious code from your site. Wordfence lets you compare your hacked files against the original WordPress core files, and the original copies of WordPress themes and plugins in the repository. Wordfence lets you see what has changed (do a diff) and gives you the option to repair files with one click and take other actions. Wordfence detects many of these problems and a lot that I haven’t mentioned here, so pay attention to our alerts and respond accordingly. Once you’ve ascertained that you’ve been hacked, back up your site immediately. Use FTP, your hosting provider’s backup system or a backup plugin to download a copy of your entire website. The reason you need to do this is because many hosting providers will immediately delete your entire site if you report that it has been hacked or if they detect this. Sounds crazy, but this is standard procedure in some cases to prevent other systems on their network from getting infected. You can usually delete anything in the wp-content/plugins/ directory and you won’t lose data or break your site. The reason is because these are plugin files that you can reinstall and WordPress will automatically detect if you’ve deleted a plugin and will disable it. Just make sure to delete entire directories in wp-content/plugins and not just individual files. e.g. if you want to delete the Wordfence plugin, you must delete wp-content/plugins/wordfence and everything under that directory including the directory itself. If you only delete a few files from a plugin you can leave your site inoperable. You usually only have one theme directory that is used for your site in the wp-content/themes directory. If you know which one this is you can delete all other theme directories. Beware if you have a “child theme” you may be using two directories in wp-content/themes – although this is rare. The wp-admin and wp-includes directories very rarely have new files added to them. So if you find anything new in those directories it has a high probability of being malicious. Watch out for old WordPress installations and backups. We often see sites infected where someone says “But I kept my site up-to-date and had a security plugin installed so why did I get hacked”. What sometimes happens is you or a developer will back-up a copy of all your site files into a subdirectory like ‘old/’ that is accessible from the web. This backup is not maintained and even though your main site is secure, a hacker can get in there, infect it and access your main site from the backdoor they planted. So never leave old WordPress installations lying around and if you do get hacked, check those first because it’s likely they are full of malware. We suggest that you do the search above and gradually increase the number of days until you start seeing changed files. If you haven’t changed anything yourself since you were hacked, it’s very likely that you will see the files that the hacker changed. You can then edit them yourself to clean the hack. This is by far the most effective and simple way to find out which files were infected and it is used by every professional site cleaning service. and that will show you all infected files containing the text “bad hacker was here”. Using just those two simple command line tools you can clean an entire infected website. How easy is that! I bet you’re ready to start your own site cleaning business at this point. We know what all WordPress core files, and open source themes and plugins should look like so we can tell if one of your source files are infected even if it’s a new infection that no one has ever seen before. We search using complex regular expressions for infection signatures and our database of known infections is continually updated. You can’t do this with simple unix command line tools or CPanel. We search for malware URLs using the Google Safe Browsing list. We use many other data sources like SpamHaus to find malware and infections on your system. If you still need help, we offer a commercial site cleaning service. You can find out more by emailing genbiz@wordfence.com with the subject “Paid site cleaning service”. I have a file that looks suspicious, but I’m not sure if it is. How can I tell? Email it to us at samples@wordfence.com and we’ll let you know. If you don’t receive a reply, either your mail system or ours may have discarded the message thinking it was malicious because of your attachment. So please email us a message without the attachment letting us now that you’re trying to send us something and we’ll try to help get it through. I’ve cleaned my hacked WordPress site but Google Chrome is still giving me the malware warning. What should I do? My site visitors are getting warnings from other security products and anti-virus systems. What should I do? Getting off the Google Safe Browsing list is a big step, but you may have some work ahead of you. You need to keep a list of every anti-virus product that is saying your site is infected. This may include products like ESET anti-virus, McAfee’s Site Advisor and others. Visit each anti-virus makers website and find their instructions for removing your site from their list of dangerous sites. This is often called “whitelisting” by anti-virus makers, so Googling for terms like ‘whitelisting’, ‘site removal’, ‘false positive’ and the product name will usually lead you to the place where you can get your site removed. How can I manually check if my site is listed on Google’s Safe Browsing List? Visit the following URL and replace example.com with your own site address. You can include a sub-directory if your site has one. The page that appears is very plain, but contains detailed information about the current status of your site, why it is listed on Google’s malware or phishing list (The google safe browsing list is actually two lists) and what to do next.